Located near the picturesque village of Rociada, New Mexico, Pendaries is the best-kept secret in the Rockies. The breathtaking scenery, challenging high mountain golf course, and tranquil valley beckon visitors each year to this hideaway in the Sangre de Cristo Range of the Rockies. 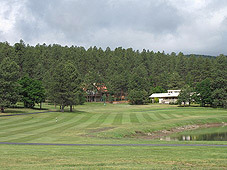 The golf course, lodge, and restaurant make a perfect getaway for golfing couples and business seminars. Tall pines and cool evenings create an atmosphere of relaxation and comfort. 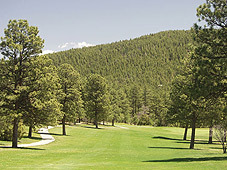 This beautifully manicured golf course begins at 7,500 feet in the clear, fresh mountain air. The course plays 6,101 yards from the championship tees, and 5,044 yards from the forward tees. 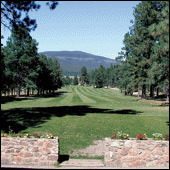 The course has a fully stocked Golf Shop, Snack Bar, and a modern fleet of golf carts. Group rates and tournament organization are available. Guests are welcome to play additional rounds of golf on the same day, on a space-available basis, for cart fee only! It’s well worth the trip to this perfect weekend getaway. Public Resort—18 Holes. Open April 15 to October 15, weather permitting. Tee times are taken up to 12 months in advance. Facility/Services: Putting Green, Pro Shop, Carts, Club Rental, Instruction, Snack Bar, Tournament Services, 18-room lodge and houses for rent; golf and housing packages available; specializing in golf outings, conferences, banquets, and weddings. Fees: Weekdays with cart (Mon–Thurs) $53.00, Twilight $33.00, Weekends with cart (Fri-Sun) $63.00, Twilight $40.00. Getting There: From Albuquerque, take I-25 north to Las Vegas; 7th Street north 12 miles to Sapello; Rt. 105 west 12 miles to entrance and guard house; stay on the paved road to the second guard house, then follow the signs.